What Is an Aspect Ratio and Why Is It Important? The home theater experience isn't complete without a TV or video projector to view your favorite TV programs, movies, and streaming content on. When picking out a new TV, the buyer is sometimes overwhelmed by the sheer selection and sizes of TVs to choose from. Not only do TVs come in big and small sizes, but there is also another factor to be aware of Screen Aspect Ratio. Screen Aspect Ratio represents the horizontal width of a TV or Projection screen (for both cinemas and home theater) in relation to it its vertical height. For example, most older analog CRT TVs (some are still in use) have a screen aspect ratio of 4x3, which gives them more of a squarish appearance. What the 4x3 reference means is that for every 4 units in horizontal screen width, there are 3 units of vertical screen height. 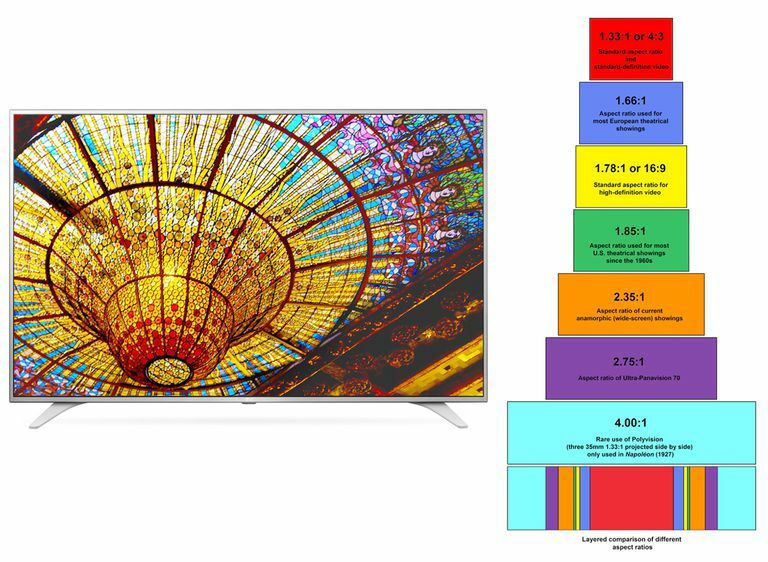 On the other hand, since the introduction of HDTV (and now 4K Ultra HD TV), TV screen aspect ratios are now standardized with a 16x9 aspect ratio, which means that for every 16 units in horizontal screen width, the screen has 9 units of screen height. In cinematic terms, these ratios are expressed in the following manner: 4x3 is referred to as a 1.33:1 aspect ratio (1.33 units of horizontal width against 1 unit of vertical height) and 16x9 is expressed as a 1.78:1 aspect ratio (1.78:1 units of horizontal width against 1 unit of vertical height). The screen width and height measurements listed provide primary information on how a TV may fit within a given space. However, the measurements exclude any additional TV frame, bezel, and stand dimensions. Definitely take a tape measure with you when shopping for a TV so that you can check the entire exterior dimensions. With LED/LCD, OLED, and Plasma TVs, the consumer needs to understand the 16x9 screen aspect ratio. TVs with a 16x9 screen aspect ratio are more suited to the increasing amount of 16x9 widescreen programming available on Ultra HD Blu-ray, Blu-ray, DVD, and HDTV broadcasts. However, there are still some consumers more used to the older 4x3-shaped screen. Unfortunately, due to the increased amount of widescreen programming, owners of older 4x3 TVs are watching a growing number of TV programs and DVD movies with black bars on the top and bottom of their screens (commonly known as letterboxing). Viewers not accustomed to this, think that they are being cheated by not having the entire TV screen filled with an image. This is not the case. Although 16x9 is now the most common aspect ratio you will encounter for home TV viewing, there are many other aspect ratios that are used in both home theater viewing, commercial cinema presentation, and computer graphics display. Most films made after 1953 were (and continue to be) filmed in various widescreen formats, such as Cinemascope, Panavision, Vista-Vision, Technirama, Cinerama, or other widescreen film formats. In order to show widescreen films so that they fill the entire screen on an older 4x3 TV, they are sometimes re-edited in a Pan-and-Scan format, with an attempt to include as much as the original image as possible. To illustrate this, take an example where two characters are talking to each other, but each is standing on opposite sides of a widescreen image. If shown full screen on a 4x3 TV without further editing, all the viewer would see would be the empty space between the characters. To remedy the empty space problem editors must recut the scene for video release by jumping from one character to the other as they speak and respond to each other. In this scenario, the intent of the film director is severely altered, because the viewer does not see the entire composition of the original scene, including any facial expressions or body language in response to the other character who is speaking. Another problem with Pan-and-Scan process is the lessening impact of action scenes. An example of this is the chariot race in the 1959 version of Ben Hur. In the original widescreen theatrical version (available on DVD and Blu-ray), you can see the entire impact of Ben Hur and the other chariot racers as they battle each other for positioning. In the Pan-and-Scan version, sometimes broadcast on TV, all you see is the camera cutting to close-ups of the horses and reins. All the other content in the original frame is totally missing, as well as the body expressions of the chariot riders. With the advent of DVD, Blu-ray, and the switchover from analog to DTV and HDTV broadcasting, TVs with screens more closely shaped to that of a theatrical movie screen are better suited for TV viewing. Although the 16x9 aspect ratio may be best for watching movie content, all network TV (with very few exceptions) and even local news, has benefited from this change. Sporting events, such as football or soccer, are well suited for this format in that now you can get the whole field in one wide shot at a closer vantage point than the distant wide shots we have been used to. When you purchase a DVD or Blu-ray Disc, many times it is formatted for widescreen viewing. On DVD packaging you may notice the terms Anamorphic or Enhanced For 16x9 Televisions on the packaging. These terms are very important, and practical, for owners of 16x9 TVs. What this means is that the image has been placed on the DVD in a horizontally squeezed format that, when played on a 16x9 TV, is detected and stretched back out horizontally in the same proportion so that the widescreen image is displayed in the correct aspect ratio without shape distortion. Also, if a widescreen image is shown on a standard 4x3 television, it is shown in a letterboxed format, in which there are black bars at the top and bottom of the image. When viewing older movies or TV programs on a 16x9 aspect ratio TV, the image is centered on the screen and black bars appear on the sides of the screen as there is no image to be reproduced. There is nothing wrong with your TV - you are still seeing the entire image on the screen - it is just that since your TV now has a wider screen width, older content does not have any information to fill the entire screen. This definitely bothers some TV viewers, and, to get around this discomfort, some content providers may add white or patterned borders to fill the black screen areas. Due to the various aspect ratios used in movie production, even on a 16x9 Aspect Ratio TV, TV viewers may still encounter black bars, this time on the top and bottom of the image.